Three-year-old Tanner Jensen and his 20-month-old brother Skyler were both born with a rare genetic condition known as Spinal Muscular Atrophy which means they can’t walk, crawl, control their heads, or even lift their arms. 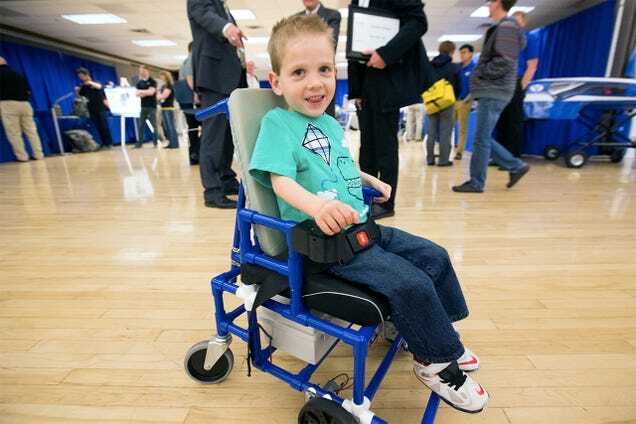 But life for the young brothers will soon be improving thanks to students at Brigham Young University who built the pair a set of tiny affordable electric wheelchairs. Motorizsd wheelchairs for younger children already exist, but they can end up costing upwards of $15,000/£10,115 which many families can’t afford even with health insurance—and the Jensens need two of them. And they’re often so large they require expensive modifications made to a home in order to be used. 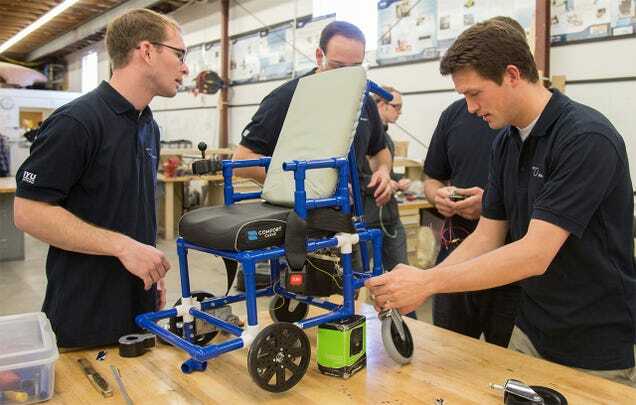 So five undergraduate mechanical engineering students from BYU’s Engineering Capstone program challenged themselves to build the world’s smallest electric wheelchair for the Jensen brothers. And after a year of designing and testing, they perfected a chair made with a PVC pipe frame that weighs just over nine kilos, but can actually support a child up to 23 kilos.